According to the Hebrew Bible, the Jebusites (/ˈdʒɛbjəˌsaɪts/; Hebrew: יְבוּסִי, Modern: Yevusi, Tiberian: Yəḇûsî ISO 259-3 Ybusi) were a Canaanite tribe who inhabited Jerusalem prior to the conquest initiated by Joshua (11:3 and 12:10) and completed by King David (2 Samuel 5:6-10). The Books of Kings as well as 1 Chronicles 11:4 state that Jerusalem was known as Jebus prior to this event. According to some biblical chronologies, the city was conquered by King David in 1003 BCE. The identification of Jebus with Jerusalem is disputed. The identification of Jebus with Jerusalem has been disputed, principally by Niels Peter Lemche. Supporting his case, every non-biblical mention of Jerusalem found in the ancient Near East refers to the city as 'Jerusalem'. An example of these records are the Amarna letters, several of which were written by the chieftain of Jerusalem Abdi-Heba and call Jerusalem either Urusalim (URU ú-ru-sa-lim) or Urušalim (URU ú-ru-ša10-lim) (1330s BCE). Also in the Amarna letters, it is called Beth-Shalem, the house of Shalem. The Sumero-Akkadian name for Jerusalem, uru-salim, is variously etymologised to mean "foundation of [or: by] the god Shalim": from Hebrew/Semitic yry, ‘to found, to lay a cornerstone’, and Shalim, the Canaanite god of the setting sun and the nether world, as well as of health and perfection. There is no evidence of Jebus and the Jebusites outside of the Old Testament. Some scholars reckon Jebus to be a different place from Jerusalem; other scholars prefer to see the name of Jebus as a kind of pseudo-ethnic name without any historical background. Theophilus G. Pinches has noted a reference to "Yabusu", which he interpreted as an old form of Jebus, on a contract tablet that dates from 2200 BCE. The Hebrew Bible contains the only surviving ancient text known to use the term Jebusite to describe the pre-Israelite inhabitants of Jerusalem; according to the Table of Nations at Genesis 10, the Jebusites are identified as a Canaanite tribe, which is listed in third place among the Canaanite groups, between the biblical Hittites and the Amorites. Prior to modern archaeological studies, most biblical scholars held the opinion that the Jebusites were identical to the Hittites, which continues to be the case, though less so. However, an increasingly popular view, first put forward by Edward Lipinski, professor of Oriental and Slavonic studies at the Catholic University of Leuven, is that the Jebusites were most likely an Amorite tribe; Lipinski identified them with the group referred to as Yabusi'um in a cuneiform letter found in the archive of Mari, Syria. As Lipinski noted, however, it is entirely possible that more than one clan or tribe bore similar names, and thus that the Jebusites and Yabusi'um may have been separate people altogether. In the Amarna letters, mention is made that the contemporaneous king of Jerusalem was named Abdi-Heba, which is a theophoric name invoking a Hurrian mother goddess named Hebat. This implies that the Jebusites were Hurrians themselves, were heavily influenced by Hurrian culture, or were dominated by a Hurrian maryannu class (i.e., a Hurrian warrior-class elite). Moreover, the last Jebusite king of Jerusalem, Araunah/Awarna/Arawna (or Ornan), bore a name generally understood as based on the Hurrian honorific ewir. Richard Hess (1997:34–6) points to four Hurrian names in the Bible's Conquest narrative: Piram (king of Jarmuth) and Hoham (king of Hebron) (Jos 10:3), Sheshai and Talmai, sons of Anak (Jos 15:14) with Hurrian-based names. The Hebrew Bible describes the Jebusites as dwelling in the mountains besides Jerusalem. In Exodus, the 'good and large land, flowing with milk and honey' which was promised to Moses as the future home of the oppressed Hebrew people included the land of the Jebusites. According to the Book of Joshua, Adonizedek led a confederation of Jebusites, and the tribes from the neighbouring cities of Jarmut, Lachish, Eglon and Hebron against Joshua, but was soundly defeated and killed. However, Joshua 15:63 states that Judah could not dislodge the Jebusites, who were living in Jerusalem ("to this day the Jebusites live there with the people of Judah"). Judges 1:21 portrays the Jebusites as continuing to dwell at Jerusalem, within the territory otherwise occupied by the Tribe of Benjamin. Certain modern archaeologists now believe that the conquest of Canaan by the Israelites under Joshua simply didn't happen, and that the Israelites actually originated as a subculture in Canaanite society. Some biblical scholars believe that the accounts in the Book of Joshua are cobbled together from folk memory of disconnected battles, with numerous different aggressors, which occurred over a time period of over 200 years. According to the Second Book of Samuel, the Jebusites still had control of Jerusalem at the time of King David, but David wished to take control of the city. Understandably the Jebusites contested his attempt to do this, and since Jebus was the strongest fortress in Canaan they gloated that even the blind and lame could withstand David's siege. According to the version of the story in the Masoretic Text, David managed to conquer the city by a surprise attack, led by Joab, through the water supply tunnels (Jerusalem has no natural water supply except for the Gihon Spring). Ever since its discovery in the 19th century, Warren's Shaft, part of a system which connects the spring to the city, has been cited as evidence for the plausibility of such a line of attack; however, the discovery, at the turn of the 21st century, of a set of heavy fortifications, including towers, around the base of the Warren's Shaft system and the spring, has made archaeologists now regard this line of attack as implausible, as it would be an attack against one of the most heavily fortified parts, and hardly a surprise. The account in 1 Chronicles mentions the advantage of a speedy attack but does not mention use of the water shafts  and according to many textual scholars[who?] the claim in the Masoretic Text could simply be a scribal error; the Septuagint version of the passage states that the Israelites had to attack the Jebusites with their dagger[s] rather than through the water shaft. The Books of Kings state that once Jerusalem had become an Israelite city, the surviving Jebusites were forced by Solomon to become serfs; though since some archaeologists believe that the Israelites were simply an emergent subculture in Canaanite society, it is possible that this is an aetiological explanation for serfs rather than a historically accurate one. It is unknown what ultimately became of these Jebusites. According to the "Jebusite Hypothesis," however, the Jebusites persisted as inhabitants of Jerusalem and comprised an important faction in the Kingdom of Judah, including such notables as Zadok the priest, Nathan the prophet, and Bathsheba, the queen and mother of the next monarch, Solomon. According to this hypothesis, after the disgrace of a rival Elide faction of priests in the struggle for succession to David, the family of Zadok became the sole authorized Jerusalem clergy, so that a Jebusite family monopolized the Jerusalem clergy for many centuries before becoming sufficiently attenuated to be indistinguishable from other Judeans or Judahites. The First Book of Chronicles states that the inhabitants of Jebus forbade King David from coming to Jerusalem shortly after he was made king. Joab went up first and took the city and became chief and captain of David's armed forces. Jerusalem is referred to as Salem rather than Jebus in the passages of Genesis describing Melchizedek. According to Genesis, the ruler of Salem in the time of Abraham was Melchizedek (also Melchizedeq), and that as well as being a ruler, he was also a priest. The Mediæval French Rabbi Rashi believed that Melchizedek was another name for Shem, son of Noah, despite Abraham's supposed descent from the line of Shem's son Arphaxad. Later, Joshua is described as defeating a Jebusite king named Adonizedek. The first parts of their names mean king and lord, respectively, but though the zedek part can be translated as righteous (making the names my king is righteous and my lord is righteous), most biblical scholars believe that it is a reference to a deity named Sydyk or Zedek, who was the main deity worshipped by the Jebusites (making the names my king is Zedek and my lord is Zedek). Scholars are uncertain, however, whether Melchizedek was himself intended in the Genesis account to be understood as a Jebusite, rather than a member of another group in charge of Jerusalem prior to the Jebusites. Melchizedek, as a priest as well as king, was likely to have been associated with a sanctuary, probably dedicated to Zedek, and scholars suspect that the Temple of Solomon was simply a natural evolution of this sanctuary. Another Jebusite, Araunah (referred to as Ornan by the Books of Chronicles) is described by the Books of Samuel as having sold his threshing floor to King David, which David then constructed an altar on, the implication being that the altar became the core of the Temple of Solomon. Araunah means the lord in Hittite, and so most scholars, since they consider the Jebusites to have been Hittite, have argued that Araunah may have been another king of Jerusalem; some scholars additionally believe that Adonijah is actually a disguised reference to Araunah, the ר (r) having been corrupted to ד (d). The argument originated from Cheyne, who, prior to knowledge of the Hittite language, proposed the reverse. The narrative itself is considered by some scholars to be aetiological and of dubious historicity. Some scholars have speculated that as Zadok (also Zadoq) does not appear in the text of Samuel until after the conquest of Jerusalem, he was actually a Jebusite priest co-opted into the Israelite state religion. Frank Moore Cross, professor at the Harvard Divinity School, refers to this theory as the "Jebusite Hypothesis," criticizes it extensively, but terms it the dominant view among contemporary scholars, in Canaanite Myth and Hebrew Epic: Essays in the History of the Religion of Israel. Elsewhere in the Bible, the Jebusites are described in a manner that suggests that they worshipped the same God (El Elyon—Ēl ‘Elyōn) as the Israelites (see, e.g., Melchizedek). Further support for this theory comes from the fact that other Jebusites resident in pre-Israelite Jerusalem bore names invoking the principle or god Zedek (Tzedek) (see, e.g., Melchizedek and Adonizedek). Under this theory the Aaronic lineage ascribed to Zadok is a later, anachronistic interpolation. According to classical rabbinical literature, the Jebusites derived their name from the city of Jebus, the ancient Jerusalem, which they inhabited. These rabbinical sources also argued that as part of the price of Abraham's purchase of the Cave of the Patriarchs (Cave of Machpelah), which lay in the territory of the Jebusites, the Jebusites made Abraham grant them a covenant that his descendants would not take control of Jebus against the will of the Jebusites, and then the Jebusites engraved the covenant into bronze; the sources state that the presence of the bronze statues are why the Israelites were not able to conquer the city during Joshua's campaign. The rabbis of the classical era go on to state that King David was prevented from entering the city of Jebus for the same reason, and so he promised the reward of captaincy to anyone who destroyed the bronzes – Joab performing the task and so gaining the prize. The covenant is dismissed by the rabbis as having been invalidated due to the war the Jebusites fought against Joshua, but nevertheless David (according to the rabbis) paid the Jebusites the full value of the city, collecting the money from among all the Israelite tribes, so that the city became their common property. In reference to 2 Samuel 5:6, which refers to a saying about the blind and the lame, Rashi quotes a midrash which argues that the Jebusites had two statues in their city, with their mouths containing the words of the covenant between Abraham and the Jebusites; one figure, depicting a blind person, represented Isaac, and the other, depicting a lame person, representing Jacob. The politicians Yasser Arafat and Faisal Husseini among others have claimed that Palestinian Arabs are descended from the Jebusites, in an attempt to argue that Palestinians have a historic claim to Jerusalem that precedes the Jewish one, similar to the more common Palestinian Arab claim that they are descended from the Canaanites. Thus, the 1978 Al-Mawsu'at Al-Filastinniya (Palestinian encyclopedia) asserted, "The Palestinians [are] the descendants of the Jebusites, who are of Arab origin", and described Jerusalem as "an Arab city because its first builders were the Canaanite Jebusites, whose descendants are the Palestinians." There is no archaeological evidence to support the claim of Jebusite-Palestinian continuity. Professor Eric H. Cline of the George Washington University Anthropology Department asserts that a general consensus exists among historians and archeologists that modern Palestinians are "more closely related to the Arabs of Saudi Arabia, Yemen, Jordan, and other countries" than to the Jebusites, and that they lack any significant connection to them. The late Johns Hopkins University Professor William F. Albright questioned "the surprising tenacity" of "the myth of the unchanging East" and rejected any assertion of continuity between the "folk beliefs and practices of the modern peasants and nomads" and "pre-Arab times." ^ Gunn 2003, p. 262. ^ Urusalim e.g. in EA 289:014, Urušalim e.g. in EA 287:025. Transcription online at "''The El Amarna Letters from Canaan''". Tau.ac.il. Retrieved 11 September 2010. ; translation by Knudtzon 1915 (English in Percy Stuart Peache Handcock, Selections from the Tell El-Amarna letters (1920). ^ See, e,g,, Holman Bible Dictionary, op. cit. supra. ^ See Victor P. Hamilton, The Book of Genesis, Chapters 1-17, p. 410 (1990). Hamilton also asserts that Sumerian uru is yerû, meaning "city." ^ Meir Ben-Dov, Historical Atlas of Jerusalem, Continuum International Publishing Group, 2002, p. 23. ^ Binz, Stephen J. (2005). Jerusalem, the Holy City. Connecticut, USA. : Twenty-Third Publications. p. 2. ISBN 9781585953653. Retrieved 17 December 2011. ^ See Holman Bible Dictionary, http://www.studylight.org/dic/hbd/print.cgi?n=3384 ; National Geographic, http://education.nationalgeographic.com/media/file/Jerusalem_ED_Sheets.FasFacts.pdf ("As for the meaning of the name, it can be assumed to be a compound of the West Semitic elements "yrw" and "s[h]lm," probably to be interpreted as "Foundation of (the god) Shalem." Shalem is known from an Ugaritic mythological text as the god of twilight."). ^ Lemche 2010, p. 161. ^ Pinches, Theophilus G., The Old Testament: In the Light of the Historical Records and Legends of Assyria and Babylonia (London: SPCK, 1908), p. 324. ^ Lipinski 2004, p. 502. ^ Biblical Archaeology Review 32:02, March–April 2006, Who Were the Jebusites?. "The letter refers to an Amorite ethnic group known as the Yabusi'um. This, Lipinski says, implies the existence of a tribe or clan of Yabusi, or Jebusites. (The Semitic letter Y becomes a J in Germanic languages such as English.) However, the clan of Jebusites in the Mari letter may not be the same as the clan of Jebusites living in pre-Davidic Jerusalem. More than one clan or tribe could have had the same name, Lipinski cautions." ^ Detlev Groddek, Silvin Košak, and Marina Zorman, Tabularia Hethaeorum, p. 155 (20007). ^ 1 Chron. 21:15 ("And the angel of the LORD stood by the threshing floor of Ornan the Jebusite."). ^ Richard S. Hess, "Getting Personal: What Names in the Bible Teach Us," Bible Review 13/6 (Dec 1997) 30, 34-36. ^ a b c Finkelstein & Silberman 2002. ^ Reich & Shukron 1999. ^ 1 Kings 9:20-21. This is inconsistent with other Biblical passages, however, that suggest that a Jebusite faction at King David's court (possibly including Bathsheba, Nathan, and Zadok) helped highjack the monarchic succession from David's older son, Adonijah, to the younger Solomon. ^ 1 Kings i. 7, 19, 25; ii. 22, 26. ^ a b Rendsburg 2001. ^ The preceding Hebrew letters are written in Aramaic square script, which came into widespread use at and after the time of the Exile. The earlier Paleo-Hebrew letters for "d" and "r" are readily and often confused. The "d" is similar to Greek delta, with the right side of the triangle often extended somewhat below the base. The "r" is similar to Greek delta with the right side of the triangle considerably extended below the base. Compare the two in the tabulation presented in the "Letters" section of the article Paleo-Hebrew alphabet. The versions presented in "Hebrew for Christians" are even more confusingly similar. 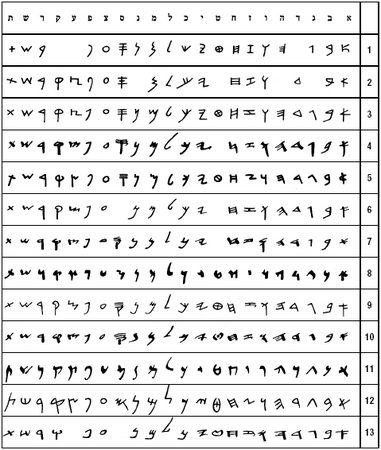 See also the table of more than ten successive versions of script beginning from circa 1000 B.C.E. to the second century B.C.E. in the Jewish Virtual Library article "Hebrew: History of the Aleph-Bet," Fig. 10. At many periods the letters are virtually indistinguishable. ^ Genesis 14:18–19 and 14:22. ^ Julius Wellhausen first espoused the theory that Ēl ‘Elyōn was an ancient god of Salem (i.e., Jerusalem), who after David's annexation of Jerusalem circa 1000 was equated to Yahweh, and that the Zadokite priests of Jerusalem were or claimed to be descended from Melchizedek. ^ Al-Mawsu'at Al-Filastinniya, vol. 2, p. 667 (As'ad Abdul Rahman ed. 1978) (Beirut: The Palestinian Encyclopedia Foundation). For additional references and citations, see David Wenkel, "Palestinians, Jebusites, and Evangelicals," Middle East Quarterly, Summer 2007, vol. 14, pp. 49–56. ^ Eric H. Cline, Jerusalem Besieged: From Ancient Canaan to Modern Israel (Univ. of Mich. Press, 2004), pp. 33–35, ISBN 0-472-11313-5. ^ William F. Albright, History, Archeology, and Christian Humanism (New York: McGraw-Hill, 1964), pp. 157, 168. Cross, Frank Moore (1997). Canaanite Myth and Hebrew Epic: Essays in the History of the Religion of Israel. Cambridge, Massachusetts: Harvard University Press. ISBN 0-674-09176-0. Finkelstein, Israel; Silberman, Neil Asher (2002). The Bible Unearthed. Touchstone. ISBN 978-0684869131. Gunn, David M. (2003). "Next Year in Jerusalem". In Thomas L. Thompson (ed.). Jerusalem in Ancient History and Tradition. Continuum International Publishing Group. ISBN 9780826466648. Jones, Gwilym H. (2009). The Nathan Narratives. The Library of Hebrew Bible/Old Testament Studies (Book 80). Bloomsbury T&T Clark. ISBN 978-0567108708. Kantor, Mattis (1992). The Jewish Time Line Encyclopedia: A Year-by-Year History From Creation to the Present. Lanham, Maryland: Jason Aronson. ISBN 978-0876682296. Lemche, Nies Peter (2010). The A to Z of Ancient Israel. Scarecrow Press. ISBN 978-0810875654. Lipinski, Edward (2004). Itineraria Phoenicia. Studia Phoenicia 18 (Orientalia Lovaniensia Analecta Book 127). Peeters. ISBN 978-9042913448. Albertz, Rainer (1994). A History of Israelite Religion in the Old Testament Period. Westminster John Knox Press. ISBN 978-0664227197. Reich, Ronny; Shukron, Eli (1999). "Light at the End of the Tunnel: Warren's Shaft Theory of David's Conquests Shattered". Biblical Archaeology Review. Biblical Archaeology Society. 25 (1). Rendsburg, Gary A. (2001). "Reading David in Genesis". Biblical Archaeology Review. Biblical Archaeology Society. 17 (1). Rowley, H. H. (1939). "Zadok and Nehushtan". Journal of Biblical Literature. Society of Biblical Literature. 58 (2): 113. doi:10.2307/3259856. JSTOR 3259856. Rowley, H. H. (1950). "Melchizedek and Zadok". Festschrift Alfred Bertholet zum 80. Geburtstag : gewidmet von Kollegen und Freunden / hrsg. durch Walter Baumgartner, Otto Eissfeldt, Karl Elliger, Leonhard Rost. Tübingen: J. C. B. Mohr (Paul Siebeck). Thompson, Thomas L. (2003). Jerusalem in Ancient History and Tradition. Contributors, Thomas M. Bolin, Philip R. Davies, Lester L. Grabbe, David M. Gunn, Ingrid Hjelm, Salma Jayyusi, Niels Peter Lemche, Sara Mandell, Michael Prior, Margreet Steiner, John Strange and Keith Whitelam. Continuum International Publishing Group. ISBN 9780826466648. This article incorporates text from a publication now in the public domain: Singer, Isidore; et al., eds. (1901–1906). "Jebusites". The Jewish Encyclopedia. New York: Funk & Wagnalls. This page was last edited on 4 April 2019, at 12:18 (UTC).